TGS Nopec, A Norwegian/US based Oil service company is a stock which was mentioned to me by a good friend and very good investor already several times over the last 2 years. Up until now, I didn’t really had the motivation to dig into it as I do not know much about oil companies in general. TGS-NOPEC is a leading global provider of multi-client seismic data and associated products to the oil and gas industry. Oil companies use this seismic data to explore for and develop oil and gas deposits. TGS-NOPEC specialises in the planning, acquisition, processing, interpretation, and marketing of non-exclusive surveys worldwide. In the multi-client model the contractor develops, manages, quality controls and markets the project. In this case the contractor remains the data owner. Multi-client data is offered to oil companies on a non-transferable user license, usually prior to application for acreage in connection with licensing rounds. Hence, the multi-client model offers both cost and time advantages for the oil companies. The contractor usually reduces the risk by securing pre-financing from oil companies in return for discounted prices. Given careful planning and risk management the multi-client model allows earning multiples much higher than the seismic contract model. The results look impressive. On average 26% ROE with a variation between +15% and 36%. As comparison, I have used CGG SA, a French seismic oil services company which also makes survey but produces (and owns) the equipment and is doing more contract work. So this is clearly something to dig into deeper. My Boss model indicates at least a fair value of twice the current price, realistically for such a good company, a P/E of 15 should be achievable if there is not any structural problem. Why is the company cheap and what do I know better ? The biggest issue is clearly the cyclical nature of the oil business in general and the current state of the cycle as well. Additionally, many big oil companies are spending more on on-shore shale exploration than off-shore. The Macondo/BP incident clearly has shown that off shore oil drilling has its risks. 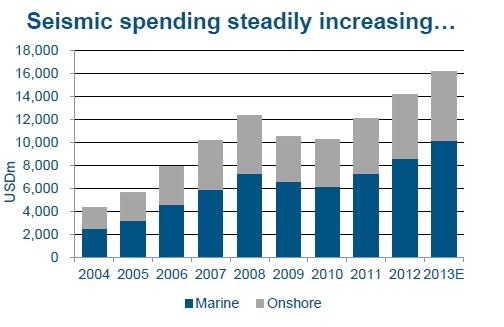 So overall spending for off-shore drilling will be clearly under pressure for some time. On top of that, the whole global warming discussion clearly takes its toll as well. Some weeks ago, a group of big funds actively challenged “Big Oils” investment into fossil fuel. This is a topic which is clearly not going away easily. So we do clearly have some structural headwinds for Big Oil and oil service companies from this side. Consensus among analysts therefore is rather muted, after a series of downgrades, only 4 of 21 analysts on Bloomberg have a buy rating, 12 are neutral and 5 recommend sell. This puts TGS among the Stoxx 600 constituents with regard to analyst ratings on rank 520 of 600 companies. As we have seen many times, even if at some point in the future for instance electrical cars will be the new standard this will take a really long time and usually much longer than anyone expects. Company specific, TGS Nopec has lowered the guidance for 2013 sales 2 times. From an initial goal of 1 bn USD sales in 2013, estmates are no ~850 mn USD. We will see later that this could be actually a prove for the “outsider” character of the company, but clearly, for any “normal” analyst, a -22% yoy reduction in sales will not lead to a buy rating. I clearly do not have any inside or better information than anyone else. On the other hand, for me, the combination of an “out of favour” sector combined with an “above average” or even “Outsider” company at a cheap price indicates a much better return/risk relationship than for instance a bet on a turnaround of a crappy German utility company. So surprisingly, the correlation from the TGS stock price with the oil price is even LOWER than for the overall stock market. Although TGS is more correlated to the two peers CGG and PGS, the overall correlation of TGS vs. oil is really low. The explanation for this could be that TGS might actually be a beneficiary of tighter budgets and lower oil prices. As multi-client seismic data is a lot cheaper than exclusive data, in relative terms TGS might take business from the “exclusive” market when times are tough. So no, I don’t have an edge here, but I still think that this is an above average opportunity. Clearly, one has to have the stomach for some underperformance as the trend is currently not TGS best friend…. Is TGS Nopec really an outsider company ? In the headline, I made the claim that TGS Nopec could be an “outsider” company, similar to those featured in the book “The Outsiders“. Well, at first, the business model is quite uncommon. A seismic data exploration company which doesn’t own the equipment and doesn’t do contract work is pretty unique. This unique business model create a rather unusual balance sheet as well. Where you would normally find equipment, vessels and stuff, we only find a “data library” as the biggest asset plus cash and receivables. This asset light business model potentially enables them to allocate capital better than the competition. If prices are unfavourable, they can cut back more easily because the don’t have a lot of fixed cost. If business is good, they rent some more boats. Equipped vessels seem to be relatively easy to hire. This is very interesting. In 2010 for instance, when off-shore activity declined overall, TGS Nopec more than doubled their investments. This chart clearly shows that they do not just follow the market but make their own decisions when and at what price they are doing new projects. Due to their flexible cost base they can much easier afford to do so than their competitors. It reminds me a little bit how good (re)insurance companies are doing their underwriting. Sacrifcing top line for profitability is something which is quite unusual but very important for long-term success. Owning the data which results in the existing library also is part of the moat of the company. A newcomer needs to invest a very large amount of money (and time) if he wants to recreate a similar data base. TGS tries to dig a wider moat by investing in data processing and interpretation as well as acquiring complimentary data services like well log data and permanent reservoir monitoring which offers additional information for the oil companies. They also relatively early invested into data processing and interpretation seems to be one of the key value drivers in the business. So in my opinion, TGS very much looks like an “Outsider company” with at least some kind of moat. Interestingly, at least one other company, Spectrum ASA tries to copy their business model. According to the 2009 IPO prospectus, the company is basically a kind of “seismic data spin-off” from a more traditional seismic data company which owned all the equipment. Interestingly, the former TGS Nopec CFO works for them now, so their investor presentations look almost identical. It is also interesting to look at presentations from “traditional” seismic companies like Polarcus or PGS. A lot of nice pictures with ships, but on the other hand the numbers speak for themselves…..
TGS does not have a majority or dominating shareholders. Among the investors, Sprucegrove with 5% and Royce with 0.7% could be called “famous” value investors. Interestingly, around 17% are held via BoNy and State Street, where the ultimate owner is not disclosed. How does TGS compare with Pulse Seismic ? I have mentioned the great post at Moatology in the beginning. With Pulse seismic, the issue is the following: I think they are in a “”sweet spot” at the moment, because a lot of their old seismic library can be sold again due to the Shale boom. Nevertheless, on a longer term “Going concern” basis, I think TGS is the better company and off shore seismic is also the better business model. TGS has by the way become a direct competitor to Pulse by acquiring Arcis, a smaller Canadian “on shore” seismic company in 2012. All in all, long-term, I think TGS Nopec is the “safer” and more diversified bet, althogh clealry Pulse Seismic might be an attractive target for some of the bigger players. Despite the negative momentum, I think TGS Nopec is a highly attractive potential “Outsider” company. It is also an interesting diversifier and natural hedge for my portfolio as I own some companies which suffer directly from higher oil prices (e.g. MIKO). In order to keep some dry powder for increases, I will start with a “half” position, which means 2.5% of the portfolios at 155 NOK per share. I like the incentive plan. TGS has been a wonderful company. Estimating short term earnings for TGS has been done by many through comparing the co guidance for MC investments (released every january) and then create a function using the amortization schedule and the historical multiplier on investment. Using avg margins, you should then be able to get a sense of what the company will make in the next 12m. But the short term is not our concern here. Not mine, anyway. The major problem going fwd is that capex spending by the oil majors is being cut at the same time that MC competition is heating up with more players going after the same business. TGS is best of breed and will do well relatively speaking, but that doesn’t mean the share price can’t fall by 40% if MC investment grinds to a halt. I’ve looked closely at TGS and decided buying above 125 is too risky (my fv estimate is about 190 NOK). yes, clearly the oil companies and their spending is the major issue here. On the other hand, if oil companies don’t develop new projects, they will be sooner or later seen (and valued) not as going concern but as liquidation. If one believes in the necessity to develop new oil sources at some time in the future, which I do, then TGS should do OK. Clearly, I would not bet half of my portfolio on it. In my opinion, situations like the current one are the only situation where you can buy a rally good company for a decent price. Vielleicht wird das einfach nur ein schlechtes Jahr. ROE könnte zum ersten Mal seit langem die magische Grenze von 10% unterschreiten. Ich habe mal eine kleine Position aufgebaut und werde mehr kaufen, wenn die Zahlen sich wieder verbessern y-o-y. Mir sind die Gründe für den Einbruch nicht ganz klar, da ich die Branche nicht gut kenne. ne, ich bin nicht Haruki. Ausserdem ist das ja nicht meine “Exklusividee” wie ich schon geschriebn habe…. Didn’t Buffett try to acquire this company? I just read about this yesterday from an interview with Charlie479. What make you think its norbert? At least the last innovation cycle (3D vs 2D) made collecting data MORE expensive (more equipment, longer time, more data crunching etc.). Clearly the data becomes better, but the initial investment higher. This actually improves the case for multi client. There are some “Network” effects, for instance it seems to be interesting to compare new data to old data (4D data including time). In my opnion, the long term “Moat” for TGS is a combination of the library, flexible business model and very disciplined “underwriting” of projects. very interesting analysis! I was reading the comments and some orange flags popped up in my head. But I do not know this industry in detail. It might not be easy to build up an seismic exploration company (see your 5 points) but some companies already in the oil sector can enter this market. The market entry is not easy but with the right relationsships and partners its not too hard. A moat in this market exists because the costs of seismic data and analysis is only a very minor part on the total costs for exploiting an oil / gas reservoir. If the data creates a small cost reduction for the overall exploitation process, the oil companies will buy it – giving pricing power to the seismic companies / shifting some part of the cost reduction to the seismic companies. If the seismic technology has a fast innovation cycle and this newer / better information will further cut costs for the exploitation process (vs. the older data) [my core contra assumption], than a oil company will finance new explorations regularly – therefore making it easy to change the seismic company. The short deprecation period of 4 years suggest a short validity of the data. This is esspecially hurting because off-shore seismic data aggregation is easier (international waters) versus on-shore (population against it, no exploration granted by private land owners). This creates a competitve situation for maintaining the best data. This competion can cause decreasing returns if the seismic companies do not repect each others areas – esp. with increasing number of competitors. The competitive situation is not as competetive if the old data or surrounding data of an area adds value to the new gathered data – than network effects in the data are working, highering the barriers to entry with increasing data volume. Are there network effects working? In summary I cannot predict the duration of the moat for the next 10 years atm. The current state of the seismic industry might have tailwinds hiding some problems from us. So are you suggesting that the main advantage here comes from having the most recent data of an area? How do new entrants to this market gain market share from TGS exactly? Is it purely location advantages? How do you gain exclusivity on areas exactly? If I am an E&P company, as the price is such a low percentage of my total costs, I would wish to choose the market leader for the service that has a reputation of efficient and clearly interpreted data. This would act like a positive feedback loop and reinforce TGS as market leader in MC surveys. Seems like TGS offers fairly good value in long term at current prices. There are few reason the library is depreciated. I had been researching CGG (XPAR:CGG) and there is discussion in the annual report about this. CGG has extensive library in Gulf of Mexico, Brazil, Baltic Sea and Angola. CGG says that there is significant overlap in the libraries of other providers and it is hard to say how much. Furthermore, CGG thinks that the data loses value over time. If you have data which is newer from some other provider, you will use that instead of the old one. Given that there are significant overlaps in data, it is not clear how the moat remains. The main argument, as I seem to gather, is that it is cheaper to license than do your own survey. But this breaks down if someone surveys for licensing the data. CGG has been investing nearly $0.25 bn a year on multi-client data for a long time. See an analysis of the company here [http://www.gurufocus.com/news/236572/cgg-a-great-business-wasted-on-incapable-management]. Why will they not outspend TGS is not clear to me. clearly the data looses value ver time. This is why it is written off after 4 years. But this is the good thing of off–shore seismic: There will be business again in the future…. Why is CGG nt outspending TGS ? I think this has to tod with the fact that for them the library is more a side show. Thanks for yet another great analysis. My only question for you here is around free cashflows. Looking back over the last 4 years of financial statements, large investments in the multi client library have consistently eaten up much of the operating cashflow. In fact, for all the stock’s volatility over the past 5 years, its free cashflow generation has remained consistently within the $100-$150m range. To me, a company trading at 25x free cashflow doesn’t seem particularly cheap, and the consistent levels of “investment” spending suggest there is little likelihood of this expenditure falling in the future. I wonder whether some of these costs might be better thought of as recurring OPEX type spend. Given these dynamics, I’d be inclined to pass on this opportunity and try and seek out more nice French and German stocks trading at close to a 10% cashflow yield. thanks for the comment. In my opinion, the net increase in the value of the library should be added back to free cashflow as this is clearly growth. Sofor 2012 for instance, this would mean 100 mn + 150 mn = 250 mn free cashflow. For the first months we are at ~120 mn free cashflow, This is lower than profit becaue of an extra ordinary tax payment. I actually think that TGS business model is one of the most cash generative I have ever seen, Without grwoth investment, Free Cashflow pretty much equals net profit. But clearly, on a first glance it doesn’tlook so nice like a “good” American Tech Stock which does all the Capex via acquisitions and shows artificially high free cash flows. That might be one of the reasons why the stock is cheap. I don’t see the multi-client library capex as a pure growth investment. Most of it is project business, isn’t it? I see you were talking of net increase. yes, the net increase in my opinion is grwoth. Pulse Seismic for instance says all the library investments are growth, but this is nonsense. This business looks great, why not rent some exploration ships + crew and do it yourself? If profitability is so high, there must be a moat, otherwise is will decline, but I cannot see any moat. So yes, it sounds kind of easy but putting 3D cameras on top of a car sounds easy too. So why do we not have 10 competitors for Google Maps ? another great read..also, just noticed that you have 361 “followers” of this blog (at least that are signed up to receive email updates) – when I signed up a couple of years ago there were just 91 one of us..shows what a wonderful job you are doing – keep it up! Seinen ersten “Mir gelingt alles”-Dämpfer bekam er schon bei den Gold-Aktien. Sein Herz für Versorger hat ihm bi jetzt auch noch nicht soviel gebracht. Tja, das Glück ist halt mit den Dummen. Ausserdem bin ich mir ziemlich sicher, dass ich nächstes Jahr unter performe. Thx for à great analyse! What i have a hard time understanding is how many times they can sell the same data. Or put in other words how much new data they need to accuire to remain the value of the library. Maybe it differs to what kind of data it is to but overall. The capex i pretty high but the company is growing so a big piece of capex is for growth. you can think about it that way: They got on average 2.5x what they invested in the library. the library had a book value of 775 mn USD in Q3 2013, so “On average” this translates 1.945 bn USD (pre tax). Plus 300 mn USD net current assets, we are at 2.3 bn USD “Net Asset value”. So the existing library under “normal conditions” accounts for ~90% of the current market cap without any new data factored in. The value of the data in my opnion correlates most likely with actual discoveries. So if one of the initial consortium members finds oil, the chance tht the data can be sold more often should increase. So there is clealry soem luck involved, but the 2.5x average should hold over time. Very interesting analysis, as we know it from you. Thanks a lot! I have also a question: Looking at the long-time-chart this share was quite volatile. From 2007 (140NOK) to 2008 (<30) the share fell 80%. Did or couldt you analyze why the share fell that much so regularly? You offered quite promising ROEs. But what about the cyclicity of sales revenue and net profts over the time? Or in other words: From its peak at 230 NOK in April 2013 the share still fell for "only" by 30%. In the former valleys of 2008, 2003 oder 1999 the decreasing period were more longer (appr. 12 months) and offered around 50% much more downward potential. What facts make you believe that 2014 is no repeat of 2007, 2002 and 1999? Why do you think it isn't much to early buying this share? I have no idea if the share price can fall further or why the share price fell so much in 2008, 2003 and 1999. I do generally not try to time share purchases based on external market expectations. Clearly, they could again trade at 4x P/E, I do not know. I buy shares when I think that I get a good deal with regard to the current price. There is clearly much evidence that at least in the short term one does better if the shares have positive momentum, but TGS for me is rather a 3-5 year investment. Nevertheless, as I have mentioned, I have started with a “half” position. Edit: One should not look too much at past prices. This is one of the typical “biavioural biases” called “Anchoring”. So I wish you much luck and wait for my part around 6-12 months till investing. I do not think about past prices but about cyclical behaviour patterns of a share. And so I ask (I did not check the company yet) if you might know be any fundamental reasons for that strongly cyclical behaviour and ih these reasons might hammer the share this time again down further 50%. good luck to you as well ! Bei “out of favour” bin ich mir bei jenem Sektor nicht so sicher, vor allem mit Blick auf PSD. Zwecks Vergleich fielen mir zunächst zwei Unternehmen mit Software zur Auswertung jener Daten ein: Landmark Graphics und Paradigm. Erste wurde aber vor einigen Jahren von Halliburton und letztere 2012 von einem Konsortium um Apax Partners übernommen. Ein verwandtes, dieselbe Kundschaft ansprechendes Unternehmen ist die Computer Modelling Group (reservoir modeling software). Auch hier kein “out of favour” und ebenso wenig bei Explorationsdienstleistern wie Schlumberger. Woher dieser Unterschied zu TGS-NOPEC? TGS selbst spricht von Verzögerungen (was vom gestiegenen Backlog gestützt wird), aber auch von zunehmendem Wettbewerb, der Projekte weniger rentabel macht, womit wohl nicht nur PSD und CGG gemeint sind. Die Capex besteht im Wesentlichen aus Intangibles (multi-client library), die auf Basis von geschätzten Umsätzen amortisiert werden. Ein gewisses Grundvertrauen ins Management ist also nötig. 2008-12: Umsatz +60%, EBIT +49%, op. CF +89%, Capex +76%, bilanzierte Multi-client library +94%. Gleichwohl ist TGS eine nähere Betrachtung wert. danke, CMG hatte ich noch gar nicht auf dem Radar. Ja klar, ein Vertrauen ins Management ist auf jeden Fall nötig. Wobei ich gerade die Aussage, dass man keine unrentablen Projekte macht, sehr positiv finde. Das erhöht mein Vertrauen ins Management deutlich. Viel einfacher wäre es einfach das Geschäft zu schreiben und dann irgendwelche Ausreden zu erfinden warum die Rentabilität runtergegangen ist oder irgendwelche Einmaleffekte rauszurechnen. Die Amortisierung wird im Übrigen nach Fixen Mindestprozentsätzen gemacht. Mindestens 40% im ersten Jahr, dann mind. 3x 20%, nach 4 jahren ist komlett abgeschrieben. In den Vergangenen Jahren wurden i.d.R. mindesten 2 mal die Investitionen verdient, im Schnitt 2,5 mal. Lässt man mal Schlumberger aussen vor, sind viele Öldienstleister sehr billig, insebs. eben die “Traditionellen” Seismic Unternehmen und insbesondere alles was “off shore”ist , z.B. auch Noble, Diamond offshore; seadrill etc. Von daher bleibe ich dabei, dass “off shore” definitv “out of favour” ist. Mal wieder eine sehr gute Analyse! Ich hätte nur eine kritische Frage, aus der sich ein paar Folgefragen ergeben. Wie hoch schätzt Du das Risiko ein, dass durch Hackerangriffe oder sonstige Wirtschaftsspionage die Datenbank auch Konkurrenten zur Verfügung gestellt wird? Ist eine Datenbank, die zusätzlich auch noch den wichtigsten Teil der Assets ausmacht, nicht ein erhebliches Risiko für das zukünftige Geschäftsmodell dieses Unternehmens? Schätzt Du das übrige Know-how und die Erfahrungen dieses Unternehmens als so wichtig ein, dass das Geschäftskonzept dennoch nicht so einfach kopierbar ist? freue mich besonder immer über kritische Fragen !!! In diesem Fall ist das sicher ein Risiko das alle Software & Datenbanken Firmen betrifft. Ein Mitarbeiter, der sich die Infos runterladet und selber vertickt scheint mir da das allergrößte Problem zu sein. M.E: dürfte in dem Fall allerdings der Verkauf nicht ganz so einfach sein. Der Seismische MArkt ist recht klein. D.h. wenn eine Ölfirma in einem Bereich zu bohren anfängt, denn nur TGS “gemapped” hat, dann kann man relativ einfach nachweisen, dass die Daten geklaut sind. Im Golf von Mexiko dürfte das nich tganz so einfach sein, aber ich denke mal die Seismic Firmen sprechen schon miteinander um sowas zu verhindern. Ein Risiko ist es aber sicher.